Heat oil in a large stockpot over medium-high heat. Add onion, jalapenos and chayote, and saute for 5 minutes until the onion is translucent and tender. Add garlic and saute for an additional minute until fragrant. Add chicken broth, tomatoes, corn, chipotles, adobo sauce, and stir to combine. Heat until nearly boiling, then reduce heat to medium-low and let simmer for at least 10 minutes. Stir in the chicken, rice, salsa verde and lime juice, and then season with salt and pepper. 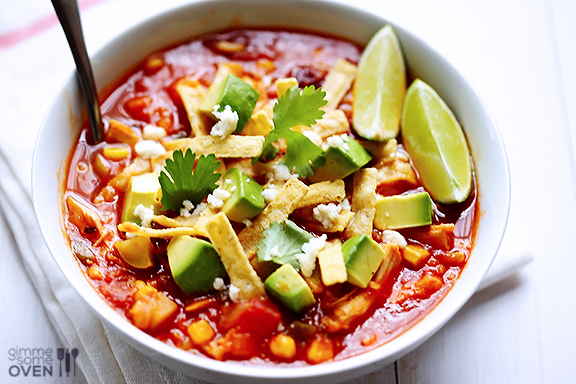 Serve warm garnished with lots of fresh avocado, cilantro, tortilla chips and queso fresco.